Show us your Happy City! Hello Buzzer readers! We have a new contest for you and it’s all about cities and happiness. Before participating, let’s first consider a few questions. Do we live in neighbourhoods that make us happy? Can we design our cities and transportation systems to maximize happiness? In his new book, Happy City, Vancouver-based author Charles Montgomery shows how urban systems, including transportation, impact our lives and shape our emotions and behaviour in ways most of us never recognize. How about you? Is there a place in your community that makes you happy? Or a place that makes your neighbourhood and community more connected and complete? Is it a neighbourhood café where ‘everybody knows your name’, a corner store, a park, a busy street, or is it a way of moving around to get where you need to be? At TransLink, we are exploring the role of transportation in building a happy city. 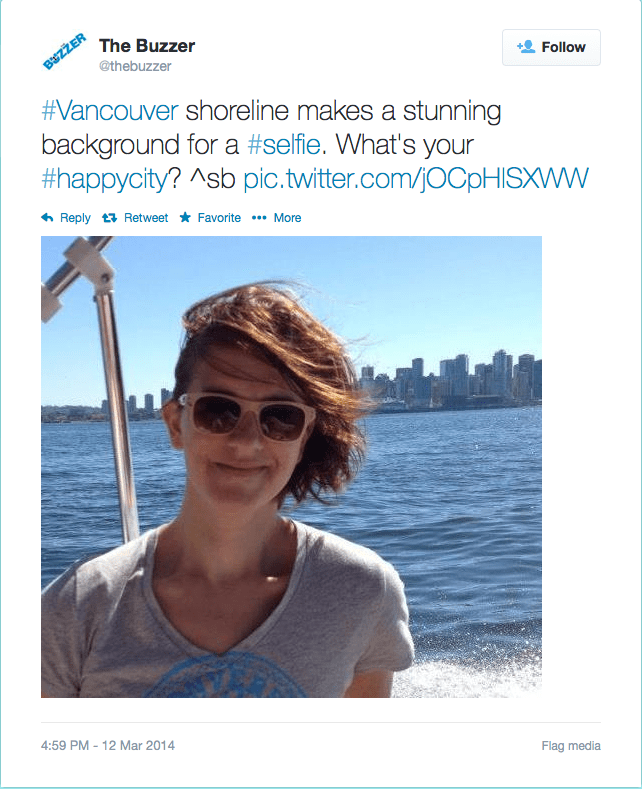 Take a ‘selfie’ picture at the place in your city or community that makes you happy. 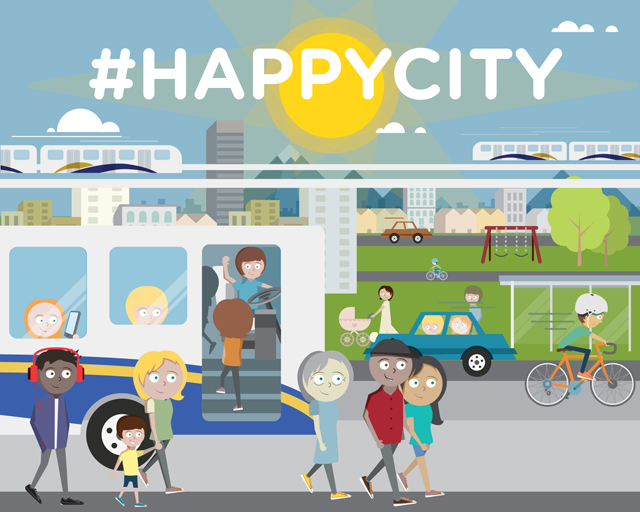 Tweet your photo to @TransLink and with the hashtag #happycity. You can add a comment explaining the image and hashtags #selfie and/or #selfienation. Post your photo on Instagram with the hashtag #happycity. Our Instagram page is TransLinkBC. Come to the lecture Choosing the Happy City by Charles Montgomery on March 26 at 7 pm at SFU Woodwards to claim your prize and learn more about the Happy City. RSVP is mandatory. One TravelSmart Travel gift pack $50 with gift card to MEC and TravelSmart Swag. Two tickets to Don Carlo opera at the Queen Elizabeth Theater. One free yearly membership and $50 car sharing credit from MODO. Before you enter, please read the contest rules and conditions. Photos may be used in the print Buzzer, the Buzzer blog, presentation during the Choosing the Happy City lecture, tweeted by @TransLink and posted on the TransLink Facebook and Instagram page. Images and posts tagged #happycity will be shared on the Buzzer blog. Join us in this conversation. Here’s my #selfie. I took it last year in North Vancouver, with the Coal Harbour in the background. This is the view I enjoy every morning while taking the Seabus to work. Pretty cool, right? The only way to be a happy city is to extend transit service to a 24 hour of service. SkyTrain needs to shape up and needs extension service on Sundays and Stat. Holidays including when maintenance is underway, skytrain then switches track and have, say every 15 on the shared line and every 30 mns seperate.